Conroe, TX Saxophone Lessons Near Me | Fun Classes. Top Teachers. Taking In-studio or in-home private lessons with a local teacher is the best way for beginners to get better at saxophone fast. Book now. Check out some of our most popular teachers near Conroe, TX including Houston, Spring, Katy, Cypress and Tomball. I have been playing various types of saxophone (alto, tenor, soprano, and bari) since I was in middle school. I have played in jazz bands and combos in high school all the way through college. I can teach many musical styles and have worked with beginners and intermediate players. I have a Master's in Music Technology from Indiana University-Purdue University Indianapolis and a Bachelor's in Music (Technology and Recording) from the University of Indianapolis. I started on the piano when I was in elementary school. I began playing the clarinet, my primary instrument, in 6th grade. I then started playing the saxophone in 8th grade and started playing the flute in high school. I also teach beginning trumpet and ukulele lessons. These are secondary instruments for me so I only teach beginners, but I can help you get started! I have played trumpet on my own off and on for years and I play a couple times a month with local ukulele groups. need to purchase additional books and sheet music. Chelsea was very patient and listened to my concerns. She had material ready for me to play and was very kind when she corrected me. She always found something I did right even when I made mistakes. Very good teacher! We sent music to Chelsea in advance and she was able to help my son with the difficult parts of his music. The time was well spent and she explained things well. We look forward to our next lesson and working with her over the next month to help him catch up. My doctorate is in saxophone and I have several years experience teaching and performing saxophone as a university lecturer, band director, and private lesson instructor. Saxophone is my primary instrument. I've taught it at the university level, as well as beginners. I'm proficient in classical and jazz styles. For beginners, I recommend Essential Elements for Band, Book 1 for Saxophone. For others, I may recommend the David Hite Foundation Studies and Melodious & Progressive Studies. For all, I teach practice techniques for good fundamentals. For booking, please sign up with TakeLessons today, and then we'll arrange a mutually agreeable meeting time. I look forward to hearing from you! Dr. Carl S. maintains an online and in-person music studio through TakeLessons, where he teaches several instruments privately and in group settings including saxophone, guitar, oboe, music theory, flute, clarinet, and piano. Carl teaches Saxophone and Jazz Studies at the University of Tulsa as an adjunct faculty member. During Spring 2019, Carl is teaching Music Theory and Saxophone at Oklahoma State University. Carl taught at Oklahoma State University as a Lecturer of Saxophone and Music Theory during Dr. Jeffrey Loeffert's sabbatical in Fall 2017. His duties included graduate saxophone lessons, graduate music theory review, graduate saxophone pedagogy, and saxophone studio class. ing the annual SDSU/Brookings Optimist Jazz Festival, directing Jazz Ensembles I-II, Jazz Combo, Jazz Improvisation lessons, Jazz Pedagogy, online Jazz Appreciation, private saxophone lessons, saxophone quartets, private oboe lessons, and group guitar class. Carl completed his Doctor of Musical Arts degree in saxophone performance at the University of Kansas in 2014, and his Master of Music Pedagogy and Performance from Oklahoma State University in 2011. He graduated from Harrah High School in 2002, earned his Bachelor of Music Education from Southwestern Oklahoma State University in 2008, and was a 5th-12th grade Head Band Director at Fairview Public schools. He is currently a member of the North American Saxophone Alliance, the Jazz Education Network, Music Teachers National Association, National Association of College Wind and Percussion Instructors, and an Honorary Member of Tau Beta Sigma. He has held previous memberships with Kappa Kappa Psi, Phi Mu Alpha Sinfonia, Kappa Delta Pi, and the Oklahoma Bandmasters Association. While at KU, Carl was also a graduate teaching assistant for the saxophone studio and jazz studies program. His responsibilities included Assistant Director of the KU Jazz Festival, directing Jazz Ensembles II-III, directing Jazz Combo III-VI, directing Saxophone Quartets II-III, teaching private saxophone lessons, assisting in saxophone studio class, and teaching the music education woodwind methods course. His Lecture Recital Document, A Performer’s Analysis of Selected Jazz Works for Saxophone Quartet, featured an interview with Bob Mintzer. Carl was a member of KU Jazz Ensemble I, KU Saxophone Quartet I, and KU's Helianthus New Music Ensemble. As a member of KU's Jazz Ensemble 1, Carl has performed with Dave Douglas, Kurt Rosenwinkel, Alex Sipiagin, Steve Owen, Gary Foster, Steve Houghton, Clint Ashlock, David von Kampen, Peter Epstein, Jeff Miley, James Miley, Roger Shew, and Brian Hamada, Brandon Draper, Rich Wheeler, Beau Bledsoe, Jeff Harshbarger, and Matt Otto. In July 2014, Carl went on a European tour with KU Jazz Ensemble I featuring Steve Leisring and Deborah Brown. Together, they performed at the Montreux Jazz Festival in Switzerland, the Vienne Jazz Festival in France, and performed in several cities in Germany. Recordings by this band resulted in KU winning the DownBeat Student Award (Graduate College Large Jazz Ensemble Division) in 2015. While at OSU, Carl was a GTA for the saxophone studio and music theory programs. His responsibilities included Music Theory I-IV tutoring and grading, sight-singing grading, piano labs, classical and jazz saxophone lessons, saxophone quartet coaching, saxophone studio Webmaster, and saxophone studio class. Carl was a member of the OSU Wind Ensemble and Jazz Ensemble 1. He had a regularly performing jazz trio and played in OSU's X2End saxophone quartet. The X2End quartet performed locally at the 2011 Navy Band Saxophone Symposium in Washington D.C., at the 2011 NASA Region IV Conference, and has won the state and division rounds of the 2010-2011 MTNA Chamber Music Competition. The X2End quartet went on to win the 3rd place prize at the national final round of the MTNA Chamber Music Competition. They also were the Division II Chamber Ensemble winners at the 2011 Hubbard Music Competition where they were awarded the 2nd place prize in the overall finals. Carl's final degree paper at OSU was a study of composer/performer collaboration. He traveled to Texas, Michigan, and Ohio to interview saxophonists and composers including David Dees, Peter Fischer, John Sampen, Marilyn Shrude, Joe Lulloff, and Charles Ruggiero. He has presented his lecture at the 2011 Navy Band Saxophone Symposium, the 2011 NASA Region IV Conference, and the 2012 OSU Single Reed Summit. As a member of OSU's Jazz Ensemble 1, he has performed with Bob Sheppard, Conrad Herwig, Wayne Bergeron, and Andy Martin. While at SWOSU, Carl performed as a member of the marching band, wind ensemble, Jazz Ensemble A, saxophone quartet, and his own jazz combo named Five-Seven. As a member of SWOSU's Jazz Ensemble A, he has performed with Dan Haerle, Bob Bowman, Jack Mouse, Fred Forney, Janice Borla, Eddie Daniels, Pamela York, Lynn Seaton, Carl Allen, Dr. Michael Cox, Tom Williams, Dr. Robert Chambers, Dave Hanson, Drori Mondlak, Delores Williams, Byron Stripling, Frank Wess, Kenny Drew Jr., Dennis Mackrel, Bill Watrous, Rich Eames, Jennifer Leitham, and Randy Drake. Carl's primary saxophone instructors have been Vince Gnojek, Dr. Jeffrey Loeffert, Dr. Ann Bradfield, Dr. Keith Talley, and William Rodney Hull. He has had additional instruction in lessons and masterclasses from Gary Foster, Dr. Joseph Murphy, Dr. Michael Cox, Bob Sheppard, Johnny Salinas, Dr. Kimberly Goddard Loeffert, Dr. Geoffrey Deibel, Dr. Jonathan Nichol, Dr. Griffin Campbell, Dr. James Laughlin, and Dr. David Dees. Carl's jazz directors have included Dan Gailey, Bob McCurdy, Dr. Jonathan Martin, Dr. Keith Talley, and Dr. Terry Segress. Carl enjoys recording several instruments in his home studio and composing new music. His compositions that have been performed include his big band arrangement of Cat Battles by Joshua Redman, September in the Refrain (alto saxophone and electronics), Funk-o-matic (jazz combo), Smooth (jazz combo), and The Deadline Arrives at Dawn (alto saxophone and electronics). As an advocate of new music involving the saxophone, he has participated in a commissioning consortium for Alone Together by composer David MacDonald through Kick Starter. In 2013, Carl performed the premier of Cuento #3 by Nelson Ramirez Diaz. During summer of 2014, he recorded selections from Dr. John Walker's "The Alto Saxophone in the Attic," published by Carl Fischer. At the 10th Annual SDSU/Brookings Optimist Jazz Festival in 2015, Carl directed SDSU Jazz Ensemble I's premier of Dog, Tired by David von Kampen. Carl is a Conn-Selmer Endorsing Artist. He hosted the North American Saxophone Alliance Region 3 (ND, SD, NE, MN, IA) Conference at South Dakota State University on March 17-18, 2017. On Saturday, April 8, 2017, Carl performed Dreams in the Dusk by David Biedenbender with South Dakota State University's Wind Symphony, directed by Dr. Jacob Wallace. On Monday, February 6, 2017, Carl performed the premiere of Lhotse for alto saxophone and percussion by Steve Danyew with Dr. Aaron Ragsdale. In April 2017, Carl performed solo tenor saxophone and orchestral clarinet in Ethan Bortnick's national PBS Special called "Generations of Music," which featured special guest, Peter Yarrow, from Peter, Paul and Mary. Great instructor! Lots of patience and extremely courteous. Made an immediate impact on improving my skills. Dr. S. has been teaching me for over a year now and I have gotten so much better as a player. I learned how to make my practice more effective and efficient better than what all my other instructers taught me. I am very grateful to have Dr. S. as my teacher, Thank You! My name is Gleb V. I am a professional music instructor and performing musician. I have sixteen years of teaching experience for children and adults of all ages, and have been recording and performing internationally for over thirty years. Specializing in saxophone, clarinet, flute and piano, I have experience in both public and private after-school programs, as well as in-home lessons settings. My formal music training began at the age of five in Vilnius Lithuania with the famous Vladimir Tchekassin. Since then, I have excelled in my saxophone studies at the Vilnius Conservatory and at the Music Academy in Cologne Germany while pursuing an active performing career. Most recently, in 2005, I followed my passion for teaching music by completing an advanced Instructor program in Instrumental Pedagogy at the Music Academy in Cologne. I have developed a teaching method that is efficient and creative, and is backed by over thirty years of professional performing experience. He was just perfect for my daughter! She loves his lesson very much and decided to learn from him. As a parent, i loved how he throughly taught us basic stuff about clarinet, assembling, parts, history, etc..
Gleb shares a wonderful energy and deep understanding of music with a practical, hands on style that makes you wish the lesson never ends! Looking forward to continuing! 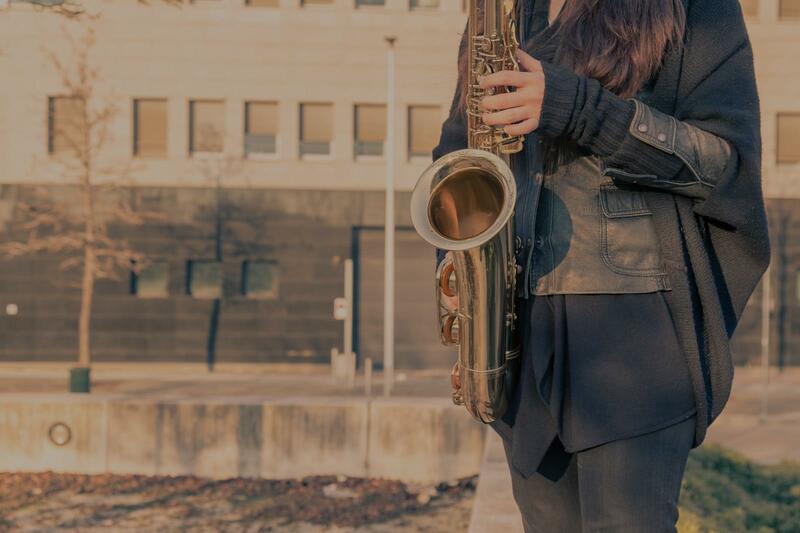 I'm an accomplished jazz, pop and classical saxophonist with experience in professional performance and in teaching students at various levels of ability. I mold my teaching to my students' stylistic preferences and academic/career aspirations, and excel at helping students become more comfortable with and more skilled at jazz improvisation. I'm a Berklee College of Music-trained multi-instrumentalist with years of teaching experience. I have experience performing, composing, and/or recording on the genres of classical, jazz, Latin, rock and pop music, and I have extensive knowledge of jazz and classical music theory. I take great pride and pleasure in helping my students realize their innate musical abilities and in providing the structure and knowledge to allow them to expand those abilities in whatever direction their passion dictates. Great instructer. Very patient. Very willing to teach you what you want. Very helpful and experienced. As I already have studied music he geared the lesson to my needs. Hi there! I am a classically trained saxophonist with a Masters from Peabody Conservatory and over 16 years of teaching experience. I tailor my lessons based on your interests and skill level, finding pieces you enjoy which challenge you. I can also give you a strong sense of the fundamentals, focusing on intonation, finger technique, vibrato and tone. Looking forward to hearing from you! Welcome to online saxophone lessons! While studying with me we will focus on practice techniques to develop your speed, vibrato and intonation (one of the most important aspects of a good sound!) For students in grade school, lessons can help your skills in band class and in participation in solo and ensemble. It is a great chance to perform works before doing an important audition! In my private teaching I have also focused on playing group pieces with my own arrangements of pop music, like Usher and Rihanna! I find it really enjoyable and it allows my students to challenge themselves while working in a different format than they are used to. mphony in D.C., where we perform concert pieces for wind ensemble. I also teach at the Levine School of Music, which is very exciting since I studied there as a teenager! Thanks for your interest and I look forward to working with you! We are on our third lesson. Great so far!! Maureen is a fantastic teacher. I work with the student to develop a curriculum based on their musical interests and my own teaching pedagogy. I strongly feel that for musicians to own their education, they must have a say in what they play. Assigning method books and mindless etudes to practice doesn't have nearly the same effect asking them "Ok, what kind of music do YOU like? What do you want to PLAY? What do you want to LEARN?". I believe that students learn best when they are invested in a subject, and the best way to get them invested is to individually get to know each one, speak to them on their level, and get them playing music they're interested in. I'm a professional performer, educator, and recording artist. I received my Masters in Music from New Mexico State University, and my BA and BMA from the College of Wooster in Ohio. Students can expect to improve their technique and performing repertoire within a matter of weeks. We will collaborate to find music that he or she is interested in, plus work on exercises that will build technique and sound quality. It doesn’t matter WHAT you’re playing, but HOW you play it. I’ve been a musician for over 20 years and played in a wide variety of settings. In lessons, I’ll draw from that experience to help students achieve their musical goals. technique is good technique, and a proficient musician should and can jump from one style to another with ease. Jeremy really enjoyed meeting Jon and taking first lesson from him because Jon was fun and relatable. He took time to explain and easy to understand. Looking forward to many more lessons from Jon. Not only to play better but to understand music theory. I am a retired high school band director, professional classical saxophonist and a woodwind repair technician. I play and teach sax, clarinet and flute. I was in the top concert band at the University of Minnesota and currently playing 1st Alto sax and conducting in s professional concert band. I am a professional saxophonist, (all saxes) a retired High School Band Director and Woodwind Repair Technician. I started private teaching as a junior in High School and have continued intermittently to the present. Almost all of my private students became first chair players. I currently play 1st alto sax in a professional concert band. I was blessed to be in the top band at the University of Minnesota which toured the Soviet union playing 28 concerts and ending up in the White House playing a concert for the President of the United States. I have worked with students and adults in a teaching setting in music, the BSA and Human Resources. I am writing in support of Mark Levenson. I have known Mark for over ten years. In this time I have been lucky to work with him on several projects. Mark is a very fine musician and a great person. 'For the past several years he has been Principal Alto and Saxophone Section Leader for the Sarasota Concert Band. This is a semi-professional Symphonic Band that I conduct. His playing is at an artist level and his commitment to the ensemble is exceptional. When needed to help out, Mark will gladly switch to play soprano, tenor or baritone saxophone for the good of the group. And he plays these equally well. Also, about once a year, Mark would take the baton and guest conduct with great ease and artistry. Mark also worked for the Board of Directors of the SCB. In this capacity he was very helpful in many aspects of keeping the band running smoothly. Raising money, suggesting music, publicity, concert and rehearsal logistics and more are all elements Mark was always willing to help with. His previous experience as a high school band director makes him able to understand and have expertise in all areas of band affairs. He is always willing to help with a positive attitude. His experience in Human Resources also helped in matters of personnel and logistics. Another way I have been involved with Mark is through his teaching. The SCB has a commitment to fostering music education in our area. Mark has served as a teacher and mentor to many high school band students in our area. We run an Honor Band, a Summer Music Camp and regular playing opportunities for middle and high school students. Mark's hard work and high level of knowledge has always helped our groups..
Mark is also a very fine musical instrument repairman. He does a great job repairing both woodwind and brass instruments. For the past decade or so he has been my main repairman for my clarinets and saxophones that I play professionally. When Mark and his family decided to leave our area, it was a big loss for us. Besides myself, many other music teachers, performers and students miss the influence of Mark. I know that Mark will continue his high standards and exceptional commitment where ever he is. Our loss is your gain. I enthusiastically recommend Mark Levenson to you. Mark is a very clear and learned instrumentalist, my instrument of choice is the Saxophone. His approach is very relaxing and direct, Mark is very complimentary towards the things I did correctly which is a real plus for a student like myself. Anna is very excited about her flute lessons after her first one. She is feeling more confident! My goal when I teach a student is to help them realize their potential on the instrument. Every person is different and so I do my best to adapt to every student I get. I also take into account the interests of the student as well. Everyone has to learn basics, but how you learn those basics is important. My goal is to help every student feel accomplished on their instrument. Hi! My name is Sean. I've been teaching saxophone lessons for about eight years now. I am highly trained & I'm working on my doctorate in saxophone currently at the University of Colorado Boulder. I play in various situations including rock bands, classical ensembles, jazz ensembles, and even worship ensembles. I have played on some big stages including playing for his Royal Highness Prince Harry of England. I'm so excited to branch out and teach students online. I'm looking forward to meeting you! These lessons are completely tailored to your level of experience and specifically, what YOU want out of learning to play and make music. Whether you are a beginning student or need help reaching that next level, I will do my best to provide you with the skills to make fantastic music for life. I teach all kinds of styles with years of experience playing in both classical and jazz environments. If you want to learn to improvise, we can do that. If your all-state band music is giving you trouble, no problem. With a few core concepts, and a dedication to practicing, I can guarantee that my methods will help you become the saxophonist you want to be. I am a professional saxophonist/woodwind doubler based out of Baton Rouge, LA. I relocated from Des Moines, IA after obtaining my Bachelor's Degree in Music Performance with a Concentration in Jazz Studies. I recently completed my studies at Louisiana State University, where I will be receiving my Master's Degree in Music in May of 2019. Currently I am actively involved in both the Classical and Jazz programs at LSU, where I participate in a variety of chamber and large ensembles, representing LSU in competitions and masterclasses throughout the Gulf South region. As a working musician and teacher, I teach regularly at area K-12 schools, providing lessons in saxophone, clarinet, and flute. I am also involved in multiple wedding and popular music groups that play primarily in south Louisiana. of my ability, but adhere to specific set of fundamentals that apply to all instruments in any style of music. My goal is for you to be the best musician that you can be, and that means consistent practice and a desire to learn. It is my job to give you the tools to reach that goal, and inspire you to move forward with a dedication to the craft. Can't find a teacher in Conroe, TX? Students are raving about their Saxophone instructors on TakeLessons. Check out some of these recent reviews. he had trying to figure out my problem with Skype so I'm sure she will be the same after hearing more of the off tune sax I have :). Thanks Shannon!" Houston, TX teacher: Shannon S.
"Very happy with the teacher!" entary towards the things I did correctly which is a real plus for a student like myself. Houston, TX teacher: Mark L.
h her right away. I'm excited about playing my instrument!" "We really enjoyed meeting Shannon. She was prepared and great with my son. We look forward to our next lesson." "It was just my first lesson but I am very pleased." Whether you're just starting out or a seasoned pro, check out the Saxophone articles on our blog. Is Saxophone Hard to Learn? Read This Before Taking Lessons.